These amazing Bourbon Glazed Carrots are cooked up perfect in an extra large skillet in about twenty minutes and are ideal for all your holiday meals. Are you hosting any holiday dinners this year? We are hosting Thanksgiving this year and it will have all the wonderful traditional fixings! It will be so nice having all the family gather together for one awesome meal. There will be roasted turkey, sausage cornbread stuffing, creamy mashed potatoes, savory gravy, Cranberry Apple Pear Pecan Jello Salad, Easy Herb Cloverleaf Rolls, Green Beans with Toasted Almonds and Garlic and of course Bourbon Glazed Carrots. I am full already and we have not even told you about our dessert. These amazing Bourbon Glazed Carrots are cooked up perfect in an extra large skillet in about fifteen to twenty minutes. Friends and family love these sweet veggies. I really enjoy the addition of the bourbon but they are also delicious without it. They are the perfect side dish for grilled steak, stuffed chicken and baked fish. 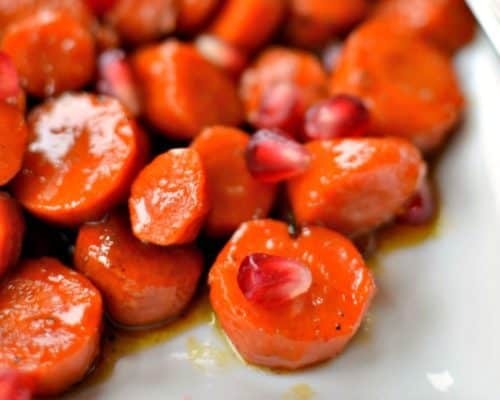 So don’t limit these amazing Bourbon Glazed Carrots just to Thanksgiving and Christmas. Melt the butter in a large skillet. Add your carrots and cook until they start to brown on the edges. Remove from heat and carefully add the whiskey. Return to the heat and cook until the whiskey is almost all gone. Sprinkle with brown sugar, cinnamon and cayenne. Then continue cooking until the carrots are tender. Make sure you stir frequently and turn the heat up the last minute of cooking to thicken the glaze. Finally sprinkle with pomegranate seeds. Carrots are one of the most widely used vegetables in the world and are versatile in so many different ethnic dishes. They are a root vegetable and it is the root that is most commonly eaten. They come in many different colors but the most common is the orange. “The health benefits of carrots include reduced cholesterol, lower risk of heart attacks, prevention of certain cancers, improved vision, and reduced signs of premature aging. ” This and other information from 10 Impressive Benefits Of Carrots! So if you are hosting a tasty holiday meal in the next few weeks or just grilling steaks tonight put these Bourbon Glazed Carrots on the menu and enjoy. Other holiday sides you will love! This post was originally published November 18, 2017 and was republished October 9, 2018 with new content. In large skillet over medium high heat melt butter. Add carrots and cook until they begin to brown on the edges; stirring frequently. Approximately 7-8 minutes. Remove pan from heat and carefully add whiskey. Return pan to heat and cook until whiskey is almost completely gone; approximately 3 minutes. Stir frequently. Sprinkle with brown sugar, cinnamon and cayenne. Continue cooking until carrots are tender; stirring frequently. Raise heat to medium high for last minute to thicken glaze. Salt and pepper to taste. 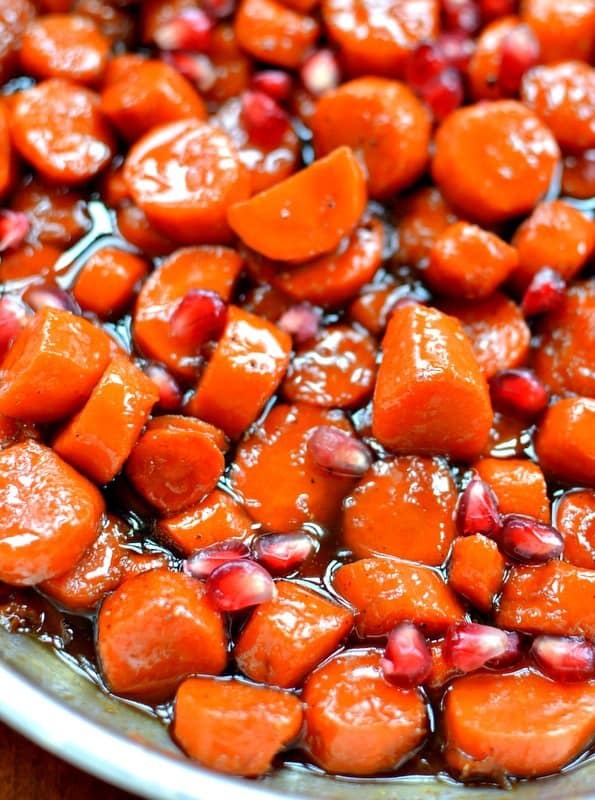 Sprinkle with pomegranate seeds and serve. If pomegranate seeds are not available You can sub fresh parsley or roasted chopped pecans. 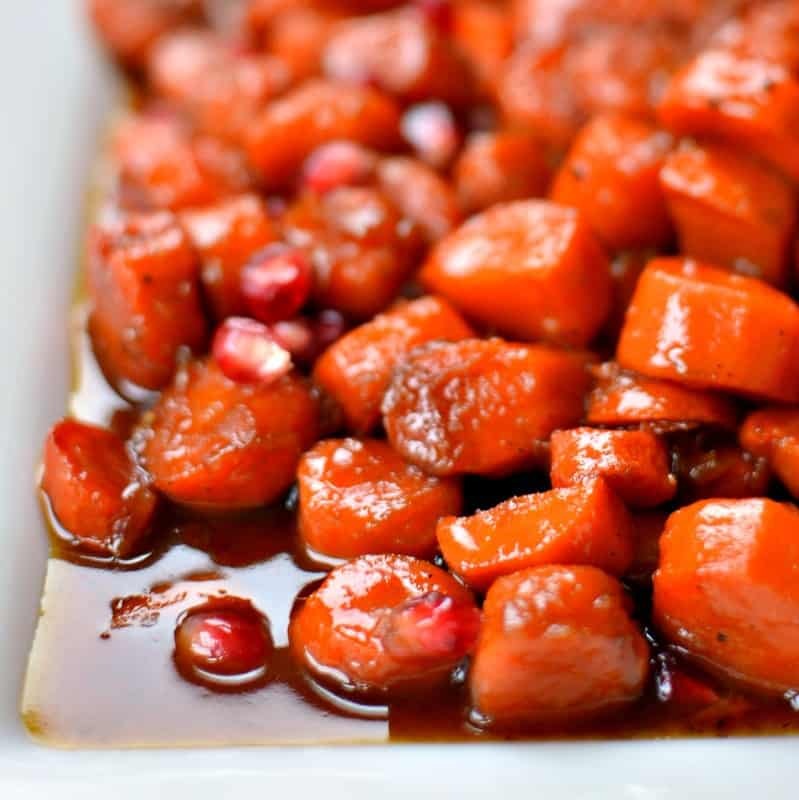 Glazed carrots are a favorite side dish for us for any meal. Love carrots as a side! Now adding a bourbon glaze just might make it my favorite! Indeed Brandy! The glaze is delicious! I love the simplicity of this dish, looks very fancy though. I love how sweet cooked carrots and when they’re cooked in a bourbon sauce I think I could eat that entire dish all by myself. No. Really! Glazed carrots are SO good!!! This is a fantastic recipe! Sounds like a fancy but easy side dish! A must try recipe! Looks really amazing! This is definitely a perfect side dish, can’t wait to try this! 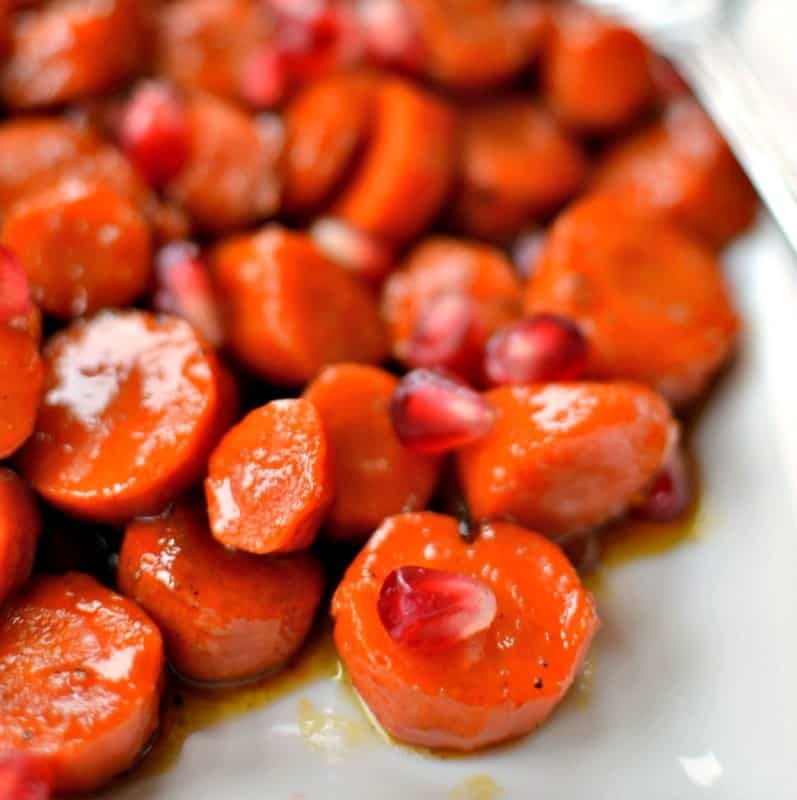 Absolutely love the flavor that these glazed carrots have! Yum! What a great side dish to add to our Easter dinner table. They look amazing! What a great side dish! My kids will definitely eat their veggies if they looked like these; I’ll have to give these a try! I am a big believer that bourbon makes everything better! Can’t wait to try these carrots! Nothing like finding a new delicious side dish! Looks fantastic! Such a great addition to any meal, need to put this on our menu!